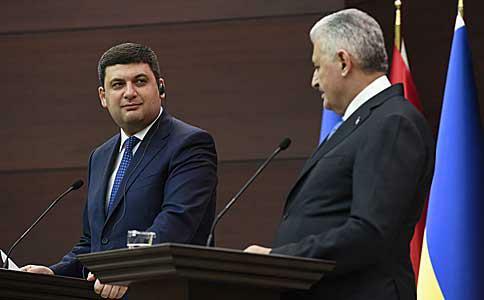 Ukrainian Prime Minister Volodymyr Groysman and Turkish Prime Minister Binali Yildirim set a goal to increase goods turnover between the two countries to $20 billion. The press service of Ukraine's Cabinet of Ministers reported that this was discussed during the negotiations of the prime ministers of the two countries in Ankara on Tuesday. In 2016, trade between Ukraine and Turkey exceeded $3 billion. "The work we are doing today to approve and sign the free trade agreement should result in the increase of trade and relax the movement of capital. It will also allow making all the required decisions to protect our investment, this, in turn, will help us to increase our potential from the point of view of industry and trade," Groysman said. The Ukrainian prime minister proposed to Turkish business to stir up work on the Ukrainian market. "The largest prospects for further economic cooperation between Ukraine and Turkey are opened in the investment sphere," he said.